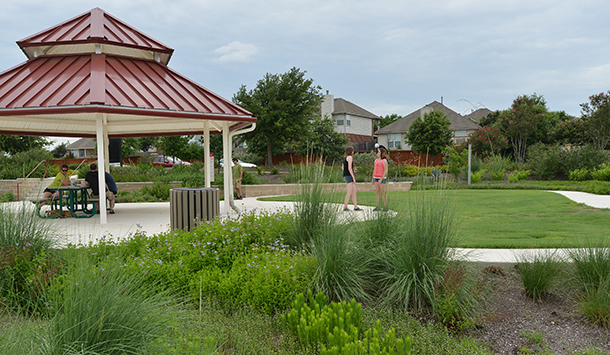 RVi held its first public meeting last week on the path toward developing the Trails Master Plan and Park Development Plans for 14 individual sites in the City of Pflugerville. RVi’s own Barbara Austin, Chris Lalich, Paul Cozzolino, and Jenn Engelke presented at the Parks Commission Workshop. With the project currently in the analysis phase, the purpose of the meeting was to present RVi’s assessment of the existing park and trail infrastructure and identify potential directions for planning and future development. Much like the human body is supported by the spine, RVi proposed organizing the trail network along a series of spines, or main trails. Secondary trails would either loop back around to the main trail or branch out to major destinations, such as schools and community facilities. Along with the Trails Analysis, RVi also presented potential uses for each of the 14 parks identified for master planning. The proposed program elements result from an analysis of the site, surrounding neighborhoods, and existing park facilities. Potential recreational amenities range from nature trails and outdoor classrooms to a dog park and community gardens. Based on input and feedback gained from the workshop, RVi will now begin the official master planning phase, with another public meeting scheduled for mid-August.